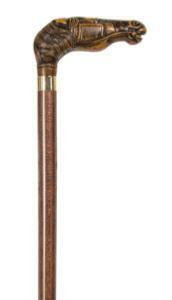 This smart collectors' cane features the head of a blinkered horse. The comfortable handle is made from acetate and is mounted on a brown, hardwood shaft fitted with a brass collar. The overall height of the cane is 92cm and it is fitted with a discreet, non-slip rubber ferrule. Ferrule size: 19mm.